Carpet often contains some of the worst allergens, germs and other hazardous materials in your home. What’s worse, they often hide in plain sight, and can negatively affect indoor air quality. Regular vacuuming can help contain these contaminants, but sometimes, a more thorough carpet cleaning is necessary to improve the air you breathe. Everything that lands on your carpet has the potential to stay, even if it’s not an obvious stain. Dust particles, hair, mold spores and pet dander — almost invisible to the naked eye — fall off your clothing and land on your floors. Walking over carpet grinds these small particles into the fibers and underlay, often leaving a carpet that looks clean but can negatively impact the air in your home. Stains are also a problem. For example, stains caused from red wine or pet urine can actually provide a food source for bacteria living in your carpets. Dirty carpets can pose a wide range of health risks. If you’ve had a flood, your carpets may have mold, even if you don’t see or smell it. Mold spores can cause breathing problems, sneezing and, over the long term, permanent damage to the respiratory system. Dust mites are also a major carpet issue; these tiny bugs burrow deep into carpet fibers and eat just about anything that comes their way. The waste produced by these mites — up to 200 times their body weight each day — can cause allergic reactions and breathing issues. Common bacteria found in carpet include E.coli, salmonella and staphylococcus. Vacuuming is always the first step in removing contaminants from your carpeting. Make sure to vacuum one or two times per week, and use a newer vacuum with powerful suction and built-in HEPA filters for a better chance of pulling up mites, allergens and dirt. But even the best vacuum can’t remove everything that hides in your carpet. 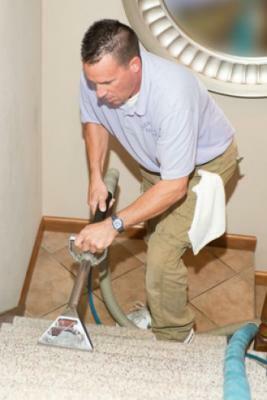 To deal with the bulk of the particles, consider hiring a professional carpet cleaning service. Most companies use steam cleaning or dry-cleaning techniques to eliminate contaminants and remove stubborn stains. Professional carpet cleaners recommend at least one cleaning per year, but high-traffic areas might require more frequent cleanings. Pacific Carpet Cleaning of Newport Beach utilizes the Most Powerful Cleaning Units on the Planet!